This is a very unusual and rather elegant solid silver letter rack. It was made by the renowned Martin Hall & Co and is dated Sheffield 1897. It is quite substantial in size measuring 6 inches high and would look rather impressive on a desk. 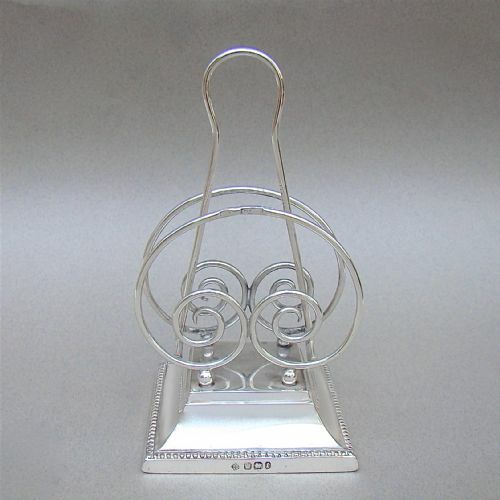 The wirework two sections letter rack is charmingly mounted on four small ball feet. It rests on a square chamfered pedestal base with a fine beaded border. The base is loaded making the letter rack very stable. The central carrying handle is tactile. It is useful and aesthetic and in my opinion very pleasing to use. RM over EH for Richard Martin & Ebenezer Hall. Date letters "e" for 1897. Base: 8cm x 8xm / 3 x 3 inches. 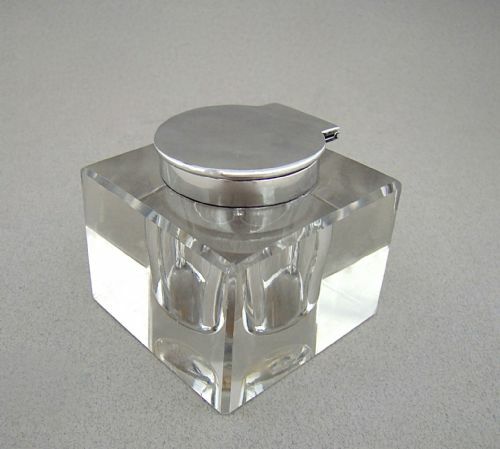 This simple and stylish silver mounted glass inkwell is dated Birmingham 1912. The silver hinged lid mounted on a square glass base. Opens to reveal a silver rim. JG&S for John Grinsell & Sons. The glass is in very good condition, no chips, no crack. The silver lid is in good condition. The hinge is good and strong. 6cm x 6cm / 2.3 inches x 2.3 inches. 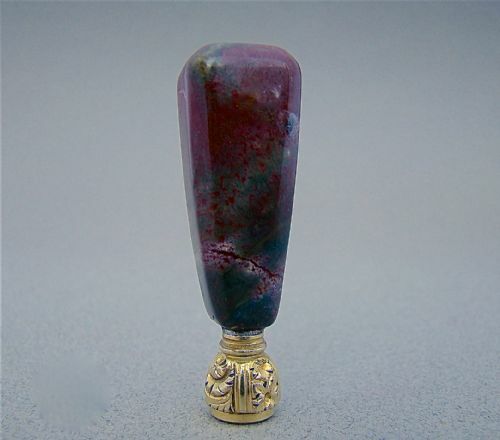 This is a very pretty silver gilt mounted seal with an agate handle. The silver gilt mount with pretty embossed decorations. It has a citrine matrix. Unmarked as was very often the case with small desk seals, but tested as silver. Diameter at widest: 1cm / 0.3 inches. This eye-catching and unusual large white opaline glass inkwell dates circa 1890 and originates from France. The circular body with central brass bound inkwell. Heightened with elegant gilt key patterns decorations. Diameter at widest: 15cm / 6 inches. The hinge and lid in very good condition. The glass body is in very good condition. Gilt decorations slightly worn at places, commensurate with age. Postage overseas: No international postage. 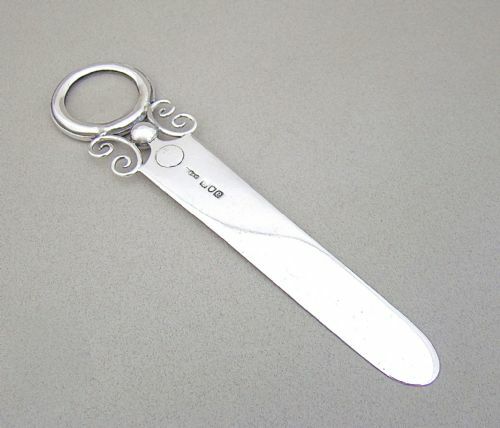 This is a very decorative and unusual medium-sized silver mounted match striker. Dated Chester 1897 and bearing the mark of the sought-after silversmiths Saunders & Shepherd. The spherical cream ceramic body with a fine textured. 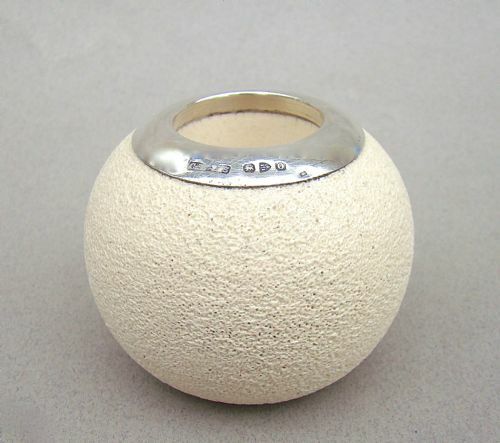 The top with a fully hallmarked silver rim. Often these were used on desks and doubled up as paperweights. Ceramic in very good condition. Diameter: 7cm / 3 inches. 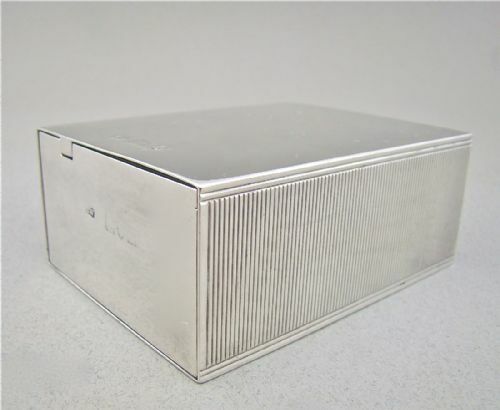 This is a wonderful solid silver playing card box made in London 1906 by the very collectable Charles & George Asprey. The Asprey were justifiably reputed for the quality and uniqueness of their products. 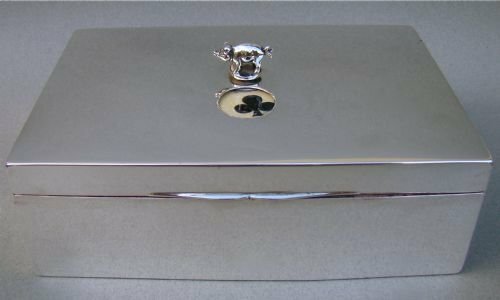 The double playing card box of plain rectangular form, the top fitted with a revolving pig, the swivelling action showing the different card symbols. The interior fitted with the original vivid red leather. The underside with stained black wood. CA.GA for Charles & George Asprey. Very minor dings on cover and sides, commensurate with age. Maker's marks and date letter slightly rubbed but legible. Length: 14.5 cm - 5.6 inches. Width: 10cm - 4 inches. Height: 5 cm - 2 inches. A truly unique card box by wonderful makers. This is a very elegant solid silver playing card box made in London 1905 by the very collectable makers William Comyns & Sons. The double playing card box is of rectangular form, the top with a raised silver medallion decorated with neoclassical patterns, inspired by Antiquity scenes and surrounded by ribbon-tied wreaths. The cover with a raised bluebell border and simple thumb piece. The interior fitted with the original red leather and matching red moire silk on the inner lid. The underside with black Morocco leather. A few minor dings on cover and sides, commensurate with age. Maker's marks slightly rubbed but legible. Length: 15.5 cm - 6 inches. Width: 10.5cm - 4 inches. This is a fabulous piece by a wonderful maker. The solid silver page turner is of plain form with wide loop handle mounted by an applied guilloche enamel four leaf clover in the most vivid green colour, which complements the silver beautifully. SM&Co LD for Sampson Mordan & Co. Length: 26.5cm / 10.4 inches. Weight: 105 g / 3.3 oz. This stunning silver and tortoiseshell inkstand was made by the renowned William Comyns and is dated London 1892. 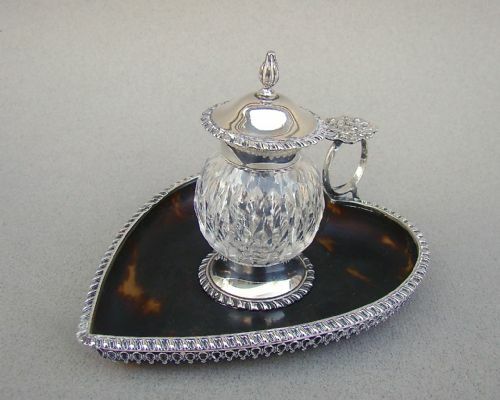 The heart-shaped tortoiseshell base mounted with an exquisite silver border. 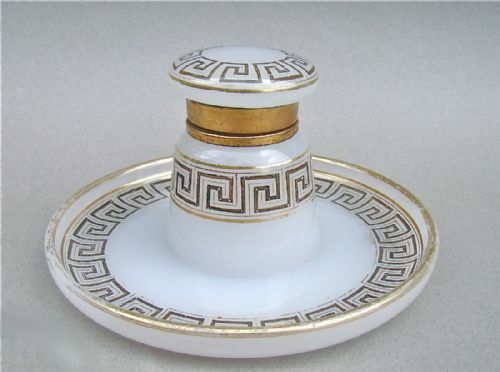 The centre fitted with a silver receptacle and detachable cut glass silver lidded inkwell. Both hinged lid and receptacle fully hallmarked. The glass inkwell fitting snuggly into the base. The heart-shape frame with delightful loop handle with pierced cast flower thumb-piece. Glass inkwell in very good condition. Tortoiseshell base in a little matt but no damage. A fabulous and very decorative item. Postage overseas: £17 International Signed For. This is a very elegant and unusual silver combination letter opener and magnifying glass by Andrew Barrett & Sons, Picadilly, London. It has a good size, 8 inches long and would have sat on a desk. It si date London 1900, date of Edward VII coronation, the circular reserve engraved with coronation crest. The solid silver mount inset with a circular magnifying glass. 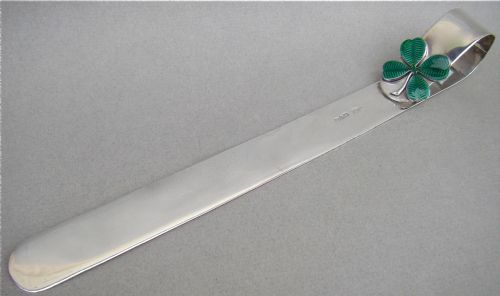 Silver bookmark with no splits. Glass with minor scratching at the centre. Postage UK: £8 Royal Mail Special delivery. Postage overseas: £15 sInternational signed for. 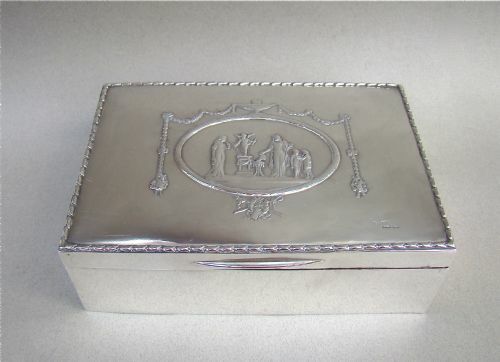 This rather fabulous and very unusual large size solid silver desk match box is dated London 1899. It has a very simple and elegant outline and has an excellent gauge of silver. The outer box is plain with a striker on one side and two indents on either side to stop the inner box from sliding out. The inner box can slide both ways. It is a very clever and pleasing design. It feels very heavy, a testimony to its fine quality. 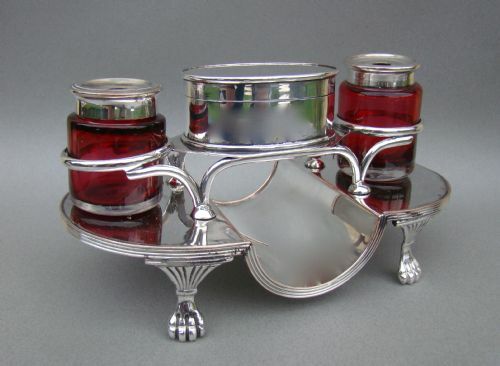 This is a very rare and rather stunning George III Old Sheffield plate double inkstand dating circa 1795. The reeded oval base with pen recess is raised on four claw feet and mounted with a wirework frame supporting two cranberry glass receptacles and a central nib container. A little copper showing through at places. Glass inkwells in excellent condition. Hinged nib container in great condition. Wirework frame solidily in place. Postage UK: £9 Special Delivery Next day.